This is a powerful non-toxic food grade and EPA exempt pesticide and cold thermal fogging equipment that was created to kill mites. It has a patented formula with only 2 ingredients, cedar oil and natural quartz rock. Using the Best Yet in the cold thermal fogger brings the droplet size down to 800 x smaller than a drop of water. The total saturation of the environment is possible because of the small size of droplet. That is why this product can kill this microscopic bug. For fogging you will need to order 1/2 to 3/4 cup per 500 square feet of living space with an 8 foot high ceiling for each treatment. The amount needed to saturate a house depends on the humidity so that is why there is a range. You may need to fog daily for about 1/2 the time you have had symptoms .Example: If you have had symptoms for a month you will most likely need to treat daily for 2 weeks. (maybe not every day after the first week but most likely). Consider the need to spot fog areas daily and treat your cars when calculating your amount and cold thermal fogging equipment. * Warning use my link to find the only reliable source for these products since I have been made aware that some other sellers are putting out product that does not work! When you order CedarCide products through this site there is no additional cost for the products since your are buying direct from CedarCide. When you place your order for CedarCide and the Swiss Formula Products (soap and sunscreen) through our site you will be registering to receive one free 30-minute phone consultation with Megan on how to use the products. To qualify, you must forward your Cedarcide online order confirmation to us as proof of purchase. Upon receipt of notification by the company that you have also ordered the Swiss Formula Products we will then email you to schedule your free appointment. CLICK HERE to see what's in a CedarCide Collebola Kits that include the products you'll need, and the fogger. Note: if you leave our linked page on Cedarcide.com and order from anywhere else on their site we will NOT get credit and will not be able to guide you on proper use. Our page on Cedarcide.com is only accessible from our site so once you leave it you must go back in through our site to that page to order for us to get credit. Because the product is an essential oil and cannot be heated without destroying its active ingredient, you will need to purchase a special cold thermal fogger to apply it correctly. This equipment is included in the Collembola Kit prices. I have shopped around trying to get the fogger cheaper, but the product is discounted to such a degree when you buy them together from CedarCide that there is no better deal out there than the one offered here. During my battle I got sick from using a laundry product from Q-based Solutions. I got boils from wearing clothes I washed in their product. It is toxic, but I was desperate and could not bleach everything I wore. I decided to try the water-soluble cedar formula CedarCide makes for use on plants. I was relieved and almost ecstatic to discover it killed everything in my clothes if I soaked things for at least an hour. It works in cold water (may evaporate faster out of hot water and not work) and does not damage the clothing at all. I began recommending this to everyone I was consulting with. 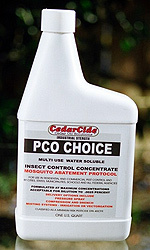 CedarCide has now started recommending it and in fact has created some Collembola Kits with PCO included for laundry. The Kits allow you to get the fogger (you absolutely must have) and buy the gallons of CedarCide Original for a really good price along with a quart of the PCO laundry product. The quart will treat approximately 16 loads at 2 oz. of product per load. If you need more PCO, it would be best to order additional laundry product found on the same page called "Refills". Order it with the kit to save on shipping. Please use the links on this site if you are re-ordering any CedarCide products. Once you forward us proof of your order you will be registered for an additional 15-minute free consultation with Megan to review your application procedure. NOTE: Orders must be at least 3-weeks apart to qualify for additional time.